Virginia neon underglow usage is governed by the state's Code. All relevant laws, rules and regulations pertaining to vehicle lighting including car underglow in Virginia have been provided below. Make sure to examine the regulations carefully and do not use any restricted lights. Usage of neon underglow lighting is governed by Virginia Code, Title 46.2: Motor Vehicles, Subtitle III: Operation, Chapter 10: Motor Vehicle and Equipment Safety, Article 3: Lights and Turn Signals. Is neon underglow legal in Virginia? Virginia law restricts additional aftermarket vehicle lighting which includes neon underglow. Therefore it’s our conclusion that in Virginia neon underglow is not legal. Only permissible aftermarket lights on civilian vehicles is an illumination sign on certain delivery vehicles (see § 46.2-1021.1. below). You may not use underbody lights while driving, but you may still use it while not on a public road. In that case make sure to avoid using colors red and blue on any aftermarket lights installed on your car, and ensure they are not flashing or rotating. Additional restriction in VA laws requires underglow to be covered as well as unlit, and due to this impracticality we do not recommend installing underglow or any other aftermarket lighting on your car. Below are all relevant excerpts from Virginia Vehicle Code that limit, restrict or allow certain aftermarket lights to be installed on vehicles. § 46.2-1021.1. Additional lights permitted on certain privately owned cars. Privately owned passenger cars used for home delivery of commercially prepared food may be equipped with one steady-burning white light for the nighttime illumination of a sign identifying the business delivering the food. Such sign shall not utilize primarily green, red or blue colors. § 46.2-1022. Flashing blue, red and blue, blue and white, or red, white and blue warning lights. That means undercarriage lighting can only be on a vehicle if it is both covered and unlit. Since having underglow covered at all times may be impractical, we do not recommend installing any additional lighting on your car. Our information about car neon underglow laws in Virginia was last updated in 2018 and checked in 2019. In case any info we provided is not up to date or correct be sure to contact us so we can revise it. Thank you! Check our data with your local law enforcement or other relevant agencies! Virginia underglow laws in certain cities or counties may be different from state legislation. While we do our very best to provide the most accurate information about LED and neon street glow usage we will not be held liable for any potentially incorrect or misinterpreted info. Virginia Code, Title 46.2: Motor Vehicles, Subtitle III: Operation, Chapter 10: Motor Vehicle and Equipment Safety, Article 3: Lights and Turn Signals. 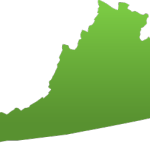 Have questions about traffic or neon glow laws in Virginia?